My trip has been delayed until tomorrow afternoon – this, sadly, has taken all the thunder out of my farewell post. 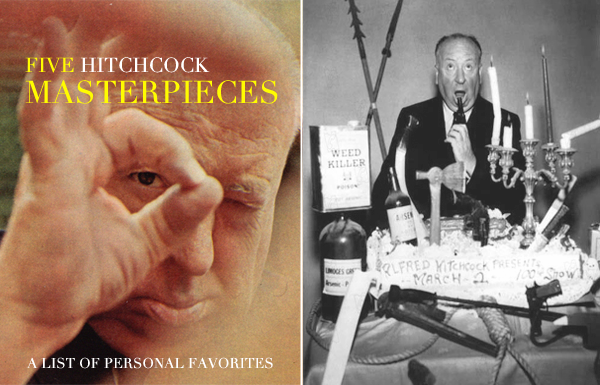 But on the other hand, it gave the once-in-a-year opportunity to make a birthday special on one my favorite artists, Alfred Hitchcock. There’s no praise high enough for this man’s work. He had his ups and downs, like all of us, but his best pieces make up for a thousand mistakes, creating a considerable amount of films that still stand as unique and exciting, even decades after their time. Mastering the art of suspense with confidence and boldness, Hitchcock’s films have been making hearts race for generations, in every sense: with excitement, compassion, repulsion, lust, and fear. And not rarely, all of these go astonishingly hand in hand. The following five films are my personal favorites from this director. Of his most acclaimed pieces I have yet to see The Birds, Dial M for Murder, and Rebecca. I’ve never written a review of a Hitchock film, apart from an impression of Psycho, because I find it immensely hard to express my thoughts and feelings on them – so do understand if some of the next paragraphs are shorter than expected, though they do grow larger towards the end – but the one thing I can confidently say is that every single one of the films below are some of my all time favorites, and that they all are, in their own way, absolutely breathtaking. Roger O. Thornhill – advertising executive, nice haircut, momma’s boy, pesky attitude – is mistaken for a government agent by a group of foreign spies. As he is chased across the country Roger meets Eve Kendall, a seductive and sharp blonde whose intentions begin to raise suspicion. It’s a thrilling, funny, and passionate ride that not only proves to be quite beneficial for the protagonist, but is also a higher form of entertainment for us. Recently considered the greatest film of all time, Vertigo is a thriller about fears and obsessions, with all the classic hitchcockian elements of suspense and sensuality. Compelling performances and a daring use of motion effects and psychedelic visuals make this a haunting film. And to be honest, I don’t think I quite get it yet. As I’ve said, I have written about Psycho before, so do read that post if you’re interested, because there’s no point in repeating myself, right? It was my first Hitchcock film, and it completely shook my perspective of what a horror film can be. What more is there to say? It’s just one of those rare movies where the effects of its eeriness sneak upon the viewer, creating what I can only describe as a feeling of deep and uncanny discomfort. Why would a man leave his apartment three times on a rainy night with a suitcase and come back three times? There. That’s all it takes for suspicion to arise: a series of events perceived subjectively by a spectator with limited knowledge. Jeff, the journalist who thinks one of his neighbours has murdered his (the neighbour’s) wife, has a broken leg and thus finds himself confined to his tiny apartment in New York. His trained curiosity makes him observe the life of his neighbours – at first he’s just innocently staring out the window, but soon Jeff will be hiding behind his long-distance professional lens. Thanks to Hitchcock’s superb camera work that smudges the line between the main character and the audience, Jeff’s obsession becomes our obsession; his excitement, our excitement; his fear, our fear. Everything Jeff feels, we feel it too – even Grace Kelly’s tantalising seduction. All of it makes Rear Window one the most gripping films I’ve ever seen, fuelled by two of the most powerful suspense ingredients: doubt, and suspicion. This is hardest one to write about. It’s been a constant worry since I first watched it, earlier this year. The feeling I get from the way it was made is that not one frame is wasted – every scene, line, and shot is carefully manipulated in order to cause the biggest impact, to obtain the deepest meaning possible. It’s an incredible feat achieved both by Hitchcock and the leading actors, Cary Grant and Ingrid Bergman. It’s the story of an american spy (Devlin) who is forced to lead the woman he loves (Alicia) into the hands of a group of Nazis, so that she can retrieve the needed information. This not only generates a situation of eminent danger for Alicia, it also creates a devastating conflict within Devlin that will result in the kind of bitterness we see in the chosen line, Dry your eyes, baby; it’s out of character. Bergman and Grant demand every bit of our attention with a love affair that is far more intense than any Austen or Brontë classic. And their passion is not in the grand gestures, but in all the looks filled with lust and longing, all the subtle and brief touches, all the sharp intakes of breath. They’ve also embodied two exquisitely written characters: a strong and beautiful woman who is broken and lost, torn between two countries, and who resorts to alcohol to lighten her chores; and a man whose harshness, cruelty, and iciness could either be due to the sudden tormented love triangle he finds himself in, or to some haunting event of his past – most likely, both. It’s a rare sight of Cary Grant, and his face in one of Notorious best scenes (above, left) is as real as it ever got, probably as he was ever allowed to be. This is also one of Hitchcock’s most impressive camera works, with odd and suggestive angles and a superb job in creating tension, anticipation and anxiety. The most common type of fear is the one of getting caught, all the thrill revolving around risky tasks usually concerning an object – like the famous key. With sharp dialogues, dry humour, nerve-racking suspense and an intoxicating love affair, Notorious is without a doubt my favorite Hitchcock masterpiece.